In revealing these twenty-six mistakes to you, my goal is to help you do more effective advertising. 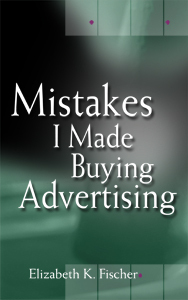 Mistakes I Made Buying Advertising was released by Monarch Tree Publishing Inc.
#15 w/o using a campaign long enough and with enough frequency to make a campaign effective. You may buy the book in print 27.95 (includes shipping) and audio 22.95 plus tax.